A Snapshot of our University today. Rhodes University, like all other public universities in our country, is in the throes of change. Much is happening in our space and all around us. Discussions are taking place at Council, Board of Governors, Senate, Institutional Planning Committee, Deans' and Heads of Departments Fora and at various other platforms about change and transformation. I trust that those who attend these meetings will always share this information with their peers and colleagues. This past weekend saw six successful graduation ceremonies for 2017. A total of 2 464 students received their degrees and diplomas. Of these, 1328 (or 54%) were undergraduate Bachelor's degrees and 1 136 (or 46%) were postgraduate degrees and diplomas. Of the 1136 postgraduate students, 295 received their Masters degrees. Of the 2 464 graduates, 59% were women, and 21% were international students. This year we produces 88 PhD graduates, up from 67 of 2016. We celebrated a new record of 29 PhD degrees for the Faculty of Humanities, up from the previous record of 19 achieved last year. The Faculty of Science produced 38 PhD graduates, the Faculty of Commerce 6, the Faculty of Education 13, and the Faculty of Pharmacy 2. A Toplist was sent out from the Vice-Chancellor's Office to our Rhodes University staff yesterday explaining that the University is under financial strain due to the fact that over the past two years, the higher education sector in the country, generally, has been grappling with the serious impact of declining subsidies and a combination of other financial pressures. Wage negotiations with organised labour at the University have deadlocked following a rejection by the unions of a 5 percent revised salary offer. The university accepts that 5% is a minimal increase but the offer reflects the current financial situation. The institution continues to engage in good faith and with complete transparency. A single percent increase in the remuneration bill is equivalent to R4 million. The current offer thus translates into an additional R20 million in salaries. In order to remain viable, the University has to realise savings of just under R10 million in the 2017 financial year and an additional R28 million in 2018. The management of the University has been working on a turn-around plan and Council further engaged with the proposals at its recent meeting. The University community has been invited to continue to be part of the processes to place the institution on a healthier financial footing through creative suggestions. We thought it would be appropriate that we inform you of the developments on our campus. Just like all university campuses in our country, our University has experienced disruptions in its academic activities. Letter from Dr Mabizela to Students and Staff of Rhodes University. Rhodes University�s response to the Minister of Higher Education & Training�s statement on university tuition fee adjustments for 2017. Rhodes University notes and welcomes the Minister's recommendations regarding university tuition fee adjustments for 2017. We particularly welcome Government's commitment to assist students who come from poor and working class families and those who come from mid-level income families. This will bring much-needed relief on these categories of students. It is important that those who can afford to pay their fees do so. Our Council will consider the Minister's recommendations in the preparation and approval of the University budget for 2017. We note with concern that the chronic underfunding of our higher education system over many years has placed it in jeopardy. Over the past few months our public universities have had heightened anxiety on the approach that would need to be adopted on 2017 tuition fee adjustments to safeguard the sustainability of these universities. We urge all role players in higher education, including students, academic and support staff, management, the private sector and the Government to bring together their collective wisdom to help South Africa find affordable and sustainable funding mechanisms for our public higher education system. In light of the assertion of Section 29 (1)(b) of our Constitution that: �Everyone has a right to tertiary education which the state, through reasonable measures, must make progressively available and accessible�, there is an urgent need to produce an intermediate and medium-term funding plan, with timelines, and framed within the overall objective of reducing the burden of university tuition fees on students and parents while ensuring the financial sustainability of our universities. Such a plan will provide direction and certainty regarding the future of our public higher education system. Our university remains committed to working with Government and all other role players in ensuring that we continue to offer a quality education to our students within a financially sustainable framework, while ensuring that academically deserving students are not excluded for financial reasons. Letter from Dr Mabizela to Staff of Rhodes University. Over the past two weeks print and electronic media have reported on what has been characterised as a �financial crisis at Rhodes�. I thought it would be appropriate that I contextualise the recent reportage on Rhodes University. Some of it has sought to sensationalise rather than inform and educate our public on the challenges faced by our higher education institutions. A letter from Vice-Chancellor, Dr Sizwe Mabizela, to apprise you of the events on our campus over the past few weeks. The University�s process with regards to broader transformation at Rhodes, including the future of the name of our University, is progressing with a sense of urgency. A sub-committee was appointed by the Institutional Forum to draw up the terms of reference for a task team that would be appointed by Council. It was agreed by the Institutional Forum that members of the task team should have impeccable credentials and command respect from all stakeholders, so that the outcome of the process can be beyond reproach. The sub-committee have met on four occasions, namely 1 June, 17 June, 19 June and 23 July. Due to the SRC member being a student, meetings could not be held during the examination and vacation periods. The terms of reference drafted by the sub-committee will be presented to the Institutional Forum for approval. These will then be presented to Council, the ultimate decision making body of the University. The Task Team will then be appointed by the University Council to canvass the views of all University constituencies including students, academic staff, support and administrative staff, Senate, Alumni, Convocation, Board of Governors and the greater Grahamstown community. The Task Team would report to the Institutional Forum and its findings would be debated and discussed by the Institutional Forum which would then draw up recommendations for consideration by Council. It is important to note that in terms of Section 65 of the Higher Education Act, the final decision regarding a change of name of a public institution of higher learning rests with its Council, and subject to the approval of the Minister. The notice from Council: Update on the future of the name of Rhodes University and institutional transformation. 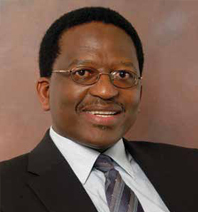 The first black African Vice-Chancellor of the 110-year-old institution, Dr Sizwe Mabizela will outline his vision during the inauguration ceremony at the 1820 Settler�s National Monument on Friday, 27 February 2015. Dr Saleem Badat is the vice-chancellor of Rhodes University. He gives from his own pocket so that more young people can get a tertiary education. Following an extensive process of nominations and deliberations, and with the approval of the University Council, it is a great pleasure to announce the Honourable Justice Lex Mpati as the new Chancellor of Rhodes University. RHODES UNIVERSITY 2012, VICE-CHANCELLOR'S GRADUATION CEREMONIES ADDRESS. "First and foremost, I wish to congratulate you, our new graduates, on your tremendous achievement. To be awarded a degree, diploma or certificate from Rhodes University entails dedicated endeavour. When you joined us you were told that at Rhodes learning and education is a partnership of mutual commitment to the pursuit of knowledge and understanding, to the development of expertise and skills, and to the embrace of appropriate values and attitudes." Rhodes University: Board of Trustees Update for 2011. 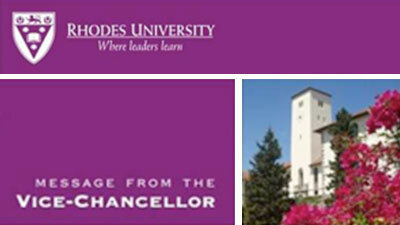 Millions to be spent at Rhodes: Rhodes University had Exciting Plans for 2012. Another year has passed and this issue of Rhodos is an opportunity to share Rhodes’ recent and intended future development with alumni, staff, students and supporters of the University. The past year at Rhodes has been evenful in many respects and this issue of Rhodos is a welcome opportunity to reflect on recent developments and also to share the emerging trajectory of Rhodes in the coming years. Some of you will have noted the new article �Rhodes university lecturer in racism row insists she was fired� carried on page 2 of the City press of 25 November 2007. Below is a further letter to the Editor of the City Press. I am issuing is as a further circular as I am not certain that the City Press will necessarily carry it although a request will be made. Some of our alumni have rightly expressed consternation at the recent article in the City Press (19 November 2007) titled �University race row heats up�. I have requested of the City Press the opportunity to reply to the allegations and claims made in the article, and I trust that such an opportunity will be provided. Dr Saleem Badat was officially inaugurated as the new Vice- Chancellor and Principal of Rhodes University on 27 September 2006. Present at this event was the Department of Education Minister, Naledi Pandor, Western Cape Premier, Ebrahim Rasool, Grahamstown mayor His Worship Phumelelo Kate, Rhodes University Chancellor, Professor Jakes Gerwel, a number of Vice- Chancellors from other universities, Rhodes University staff members and students.